Glycans and Our Technology | GlyTech, Inc.
GlyTech has developed world-leading technology for the mass production of human-type glycans and the chemical synthesis of glycopeptides and glycoproteins. 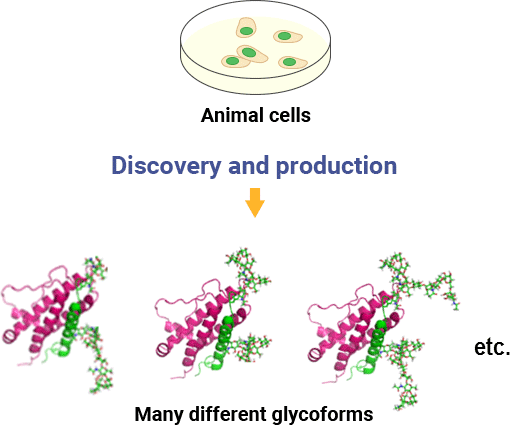 Glycoprotein drugs are conventionally produced using animal cells (“expression”). This is not only costly, but also involves complex biological processes that are difficult to control. Glycoprotein drugs produced using animal cells are often a mixture of different structures. The expressed biopharmaceuticals often contain a mixture of glycan structures (“glycoforms”), and their ratios can vary from batch to batch. This can cause problems such as increased risks of side effects and reduced efficacy if non-human or undesirable glycans are included, and makes quality control difficult. GlyTech is able to produce glycans with controlled structures and attach them to target peptides or proteins with chemical methods. This approach prevents contamination, reduces differences between batches and results in highly pure products that contain desired glycans only. Targets that are difficult or impossible to prepare by cellular expression methods can also become accessible. This ability to precisely tune glycans, glycopeptides and glycoproteins on a mass scale has the potential to greatly expand possibilities in new drug development, fundamental life science research and biological applications of glycans. In addition, through this technology we aim to promote and support the continuing and future development of new biopharmaceuticals, particularly towards the screening of new drug candidate seeds.